This little trio is my go to for setting my makeup. Each of these powders are designed to give skin a different, lit from within glow. Radiant light (far right) adds a subtle Bronze glow to skin. I like to use this if my foundation is slightly too pale and this makes it match my skin tone. It is also great to use as a Bronzer and warm up the cheeks. Incandescent light (centre) is the perfect subtle highlight on the cheek bones, This would also be a good setting powder for very pale people. 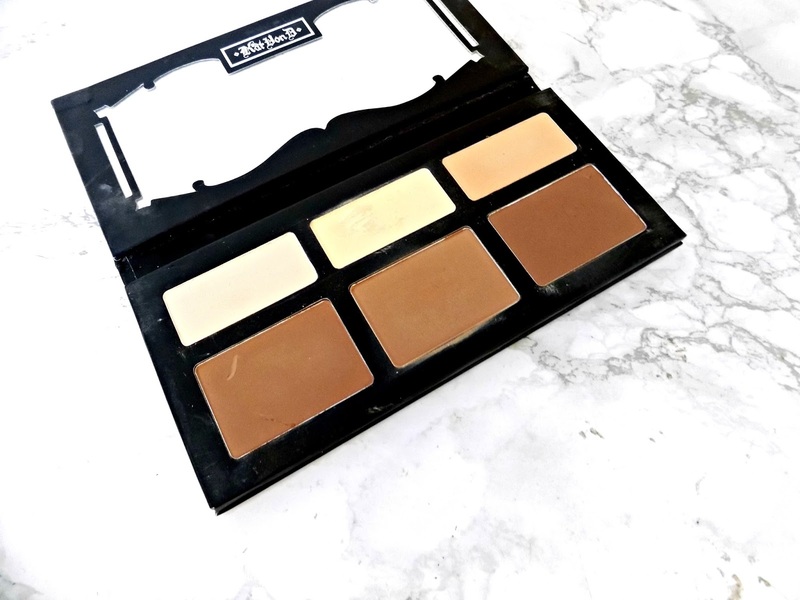 Dim Light is my most used shade, this is perfect for setting my makeup and adding the most gorgeous glow to the skin. None of these are over the top, or glittery. If you have dehydrated skin, like me and struggle with powders I can't recommend this enough! They are all finely milled and buttery soft. They apply like a dream. These are pricy but well worth the money! 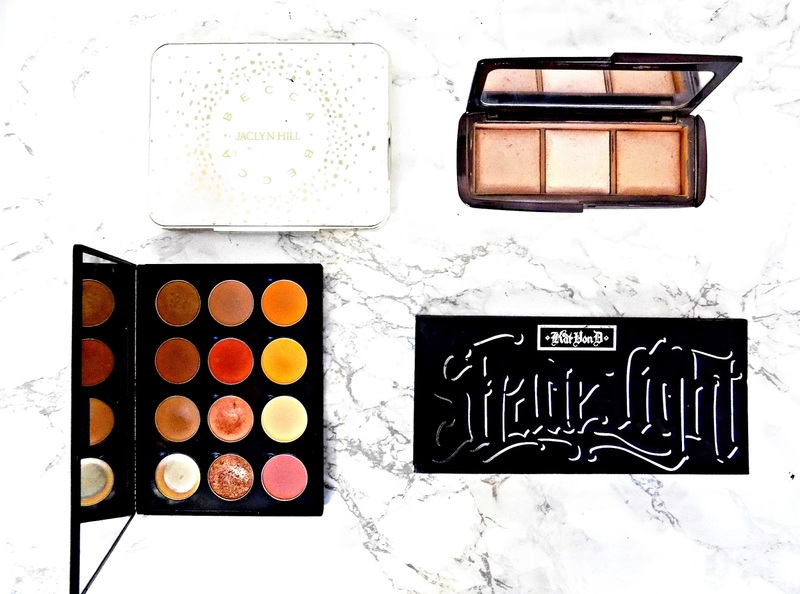 Makeup Revolution do a very similar palette though, see this post for more details. Contouring has become a step in my makeup routine I can't miss. I just feel more put together when I've done it. So I find myself reaching for the Kat von D palette to achieve that natural contoured look. This houses 6 shades in sturdy cardboard packing. 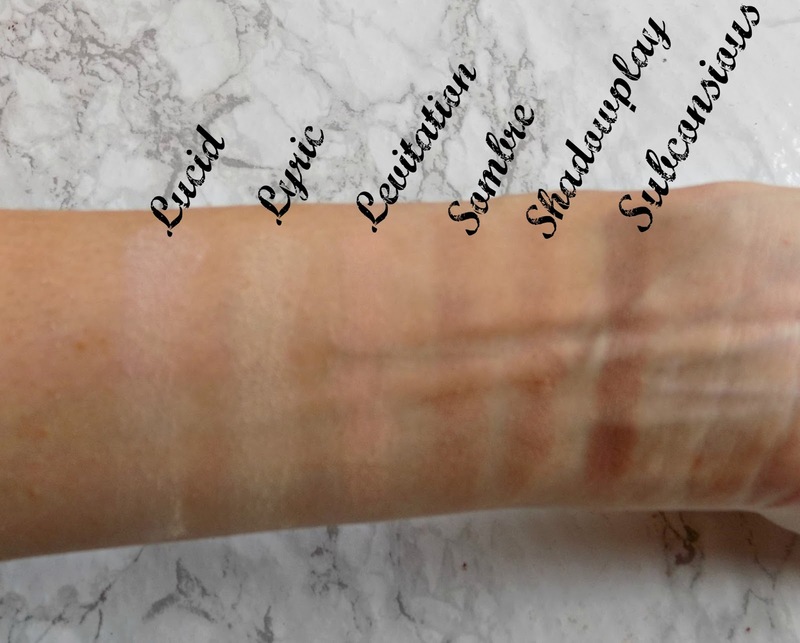 3 of the shades are dark contour colours, all vary in tone. And 3 matte pale highlight shades that are perfect for setting under eye concealer. Sombre (Far left) is a warm toned matte Brown, not too warm it can't be used as a contour shade. I find slightly warmer tones work a lot better on me. This shade is what I reach for if I want an intense contour look. Shadow Play (centre) is more milky than Sombre. This is the shade I use everyday, it gives a perfect defined look to the cheek bones, without being too over the top. Subconscious is the coolest shade of the 3. This is too cool for me to work but would be great for others. Lyric (centre) is my favourite of the highlight shades. It has a Yellow tone, which works well at brightening the skin. This is one of the best Yellow powders I've come across. It really brightens the under eye area and sets concealer, but without leaving a Yellow cast. This looks amazing in pictures too, like I've been air brushed or something. It's amazing! I hate to talk about something that's unavailable, I think the split pans with the highlighter and the blush are though. But this is another palette I use regularly. And how beautiful is it! Not only that, it's very functional. 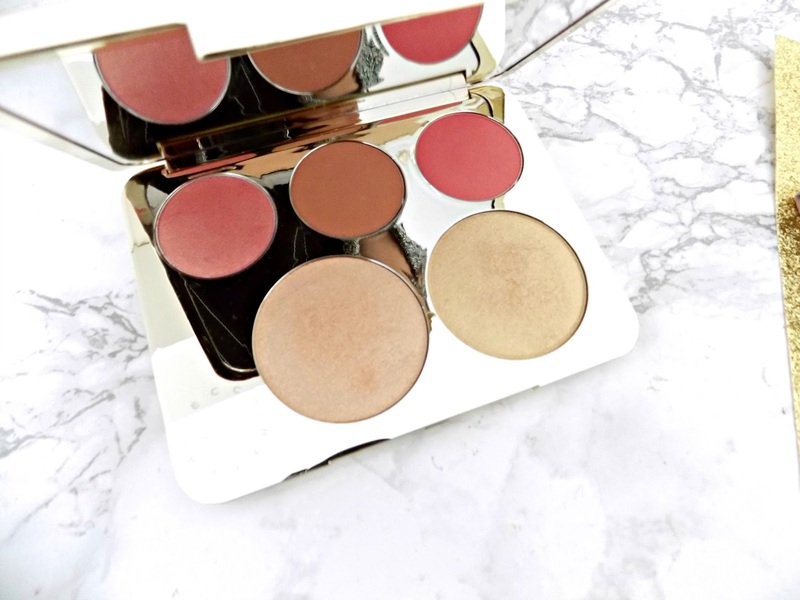 This palette houses 2 highlighters, the famous Champagne Pop (a stunning Champagne toned highlighter) and Prosecco Pop, which is more Gold in tone than Champagne Pop but equally as stunning. There are also 3 blushes in here too. Rose Spritz, a luminous Pink blush, with Gold shimmers running through it. Amaretto is a warm toned Brown colour. This is my favourite blush shade, it's perfect for everyday wear. This would also make a good bronzer for paler skin tones. And finally Pamplemousse with is a bright Coral colour. Everything in this palette is as you would expect from Becca - buttery soft, well pigmented, easy to work with and long lasting. See my full review here. Rapunzel - a gorgeous creamy shimmery colour. I like to use this as an eyeshadow base, which is why I've hit pan. This is also a really good highlight shade. 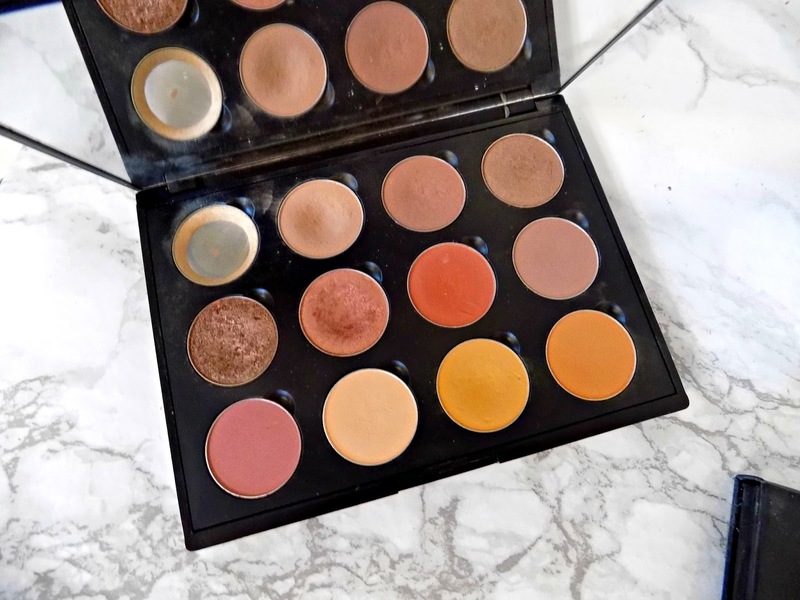 Creme Brulee - This is my go to crease colour, I reach for it even when using other palettes. It's just the most perfect warm toned medium Brown. Frappe - This is another warm toned Brown that is slighter darker than Creme Brulee. I like to use it to deepen the crease. Pocket Change - This is a new addition to my collection but a very welcomed one! It's a stunning Muted Gold colour with warm undertones and a frost finish. The perfect lid colour. Grandstand - I just love the shade. It's a Rose Gold colour with slight Taupey under tones. It's from the Makeup Geek foil line which means it is super pigmented and so soft! Cosmopolitan - Another one of my most worn lid colours. This is a beautiful Rose Gold with Gold shimmers in it. Morocco - This is a matte warm toned Red. This does look scary in the pan but translates beautifully on the eye lids. I like to use a tiny amount, on a fluffy brush to warm up the whole eye look. Bake Sale - this is another new addition. Which is a warm toned muted Brown. This is a great crease colour. Tuscan Sun - This is warm toned, matte Pink. That works well in the crease. Peach Smoothie - this a really pale Peach colour. This works well crease for adding extra dimension to any warm toned look. Chickadee - This is warm matte, Yellow, Orange colour. This is actually one of my favourite shades. I like it in the crease when I'm creating a warm Orange look. Earlybird - this shade is very similar to Chickadee only slightly darker. Earlybird and Chickadee work so well together. 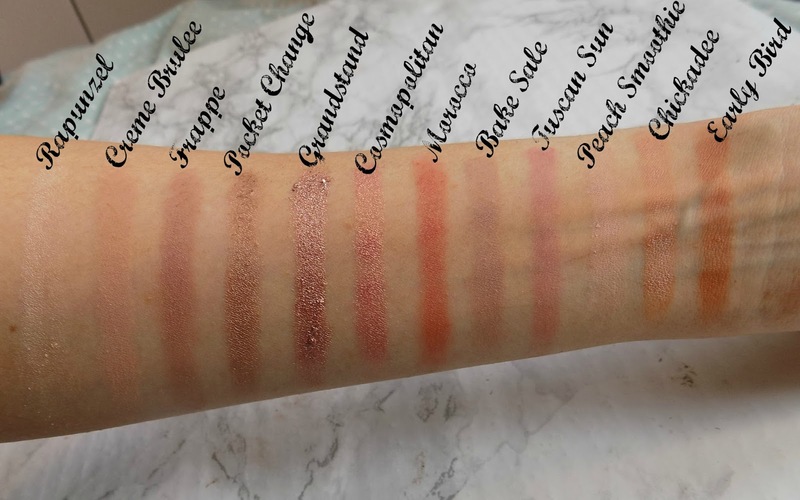 All these Makeup Geek shades are buttery soft, super pigmented and easy to blend. I can't recommend them enough! So there's a little round of some of the palettes I reach for almost daily. Have you tried any of these? What are you thoughts?